Let’s look closer. When you deliberately soften your glutes, then the hip extension comes from the hamstrings, because your hamstrings work as synergists to the gluteus maximus for this action. 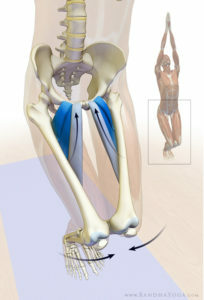 So, why not just use your hamstrings to extend the hips and avoid getting scolded for using the prime movers (glutes)? Well, if you do that enough, you potentially set up a muscle imbalance that can lead to “synergistic dominance” wherein the hamstrings become the prime mover of this action. In the hip joint, this can result in abnormal kinematics and, ultimately, pain. I’ll go over some other problems with doing backbends without the glutes in Part II of this series. The “solution” that is usually proposed for this is to have folks try to squeeze a block between their knees to “fire those adductors!” In India, this instruction was often accompanied by much shouting at the frustrated person attempting it. There is a reason, however, why this cue works so poorly, despite the yelling. That is because when your hips are extended (in a backbend), the orientation of the adductor muscle fibers makes them become external rotators of the hip and synergize the gluteus maximus in splaying your knees apart. So it’s a bit like hitting the brakes and gas at the same time. Frustrating. This cue works well, but it must be implemented in a sequence to function optimally. You have to engage the hip internal rotators before going up into the backbend. It’s difficult to engage them once you are up in the pose because when the hips are extending, the TFL and front part of the gluteus medius are at a biomechanical disadvantage for initiating contraction. 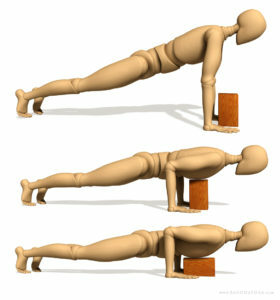 Thus, you want to first train the cue to engage these muscles with the hips flexed, where it is easy to contract them. Then bring in the glute max to do the backbend. I’ve taught this sequence all over the world and had great feedback. 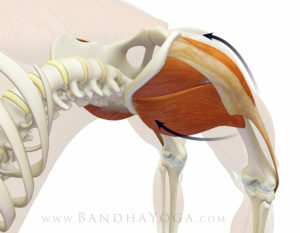 Done properly, the muscles form a “sheath” that lifts the pelvis in a balanced and stable fashion. 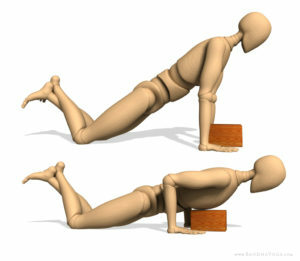 Lie on your back and bend your knees so that your feet are flat on the ground as shown. Place your hands on the front part of the pelvis to feel your internal rotators contract. Now, on exhalation, press the feet down and attempt to scrub them apart while allowing you knees to roll inward. Don’t actually move your feet. You should be able to feel your TFL contract. Release on the inhalation and repeat for about 10 times to train the action. Press your feet down and then attempt to scrub them away from the midline. The feet should remain fixed on your mat, as your knees roll inward and you should feel your muscles contract if you’ve got it. This article was originally posted on dailybandha.com. 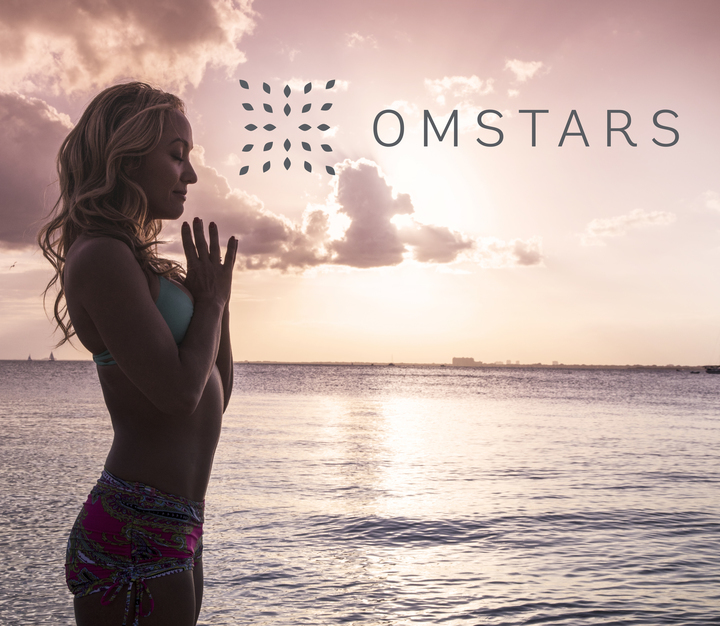 Now put the techniques to practice, or learn more about yoga anatomy with Tim Feldmann on Omstars! If you’r’e new to yoga, you might not be aware of how much awareness goes into every single pose in the practice. When we’re in tadasana (mountain pose) we’re not just standing there; we’re activating a set of very specific muscles throughout the body to create strength, get grounded and find balance. When we’re in upward facing dog, we’re nut just pressing ourselves up with our hands; we’re also activating every single muscle in our backs and our abdomens to protect our spines. Asana is not just about making shapes with our bodies, it’s about developing a deep awareness of the body as we work to build both mental and physical strength and flexibility. In today’s blog post, Dr. Long is sharing his anatomy insight to teach us how to refine one of the most basic poses in the practice: downward facing dog. In our blog post, “Strong Thigh Muscles Benefit People with Knee Osteoarthritis,” we gave a tip for activating the tensor fascia lata in Downward Facing Dog. This synergizes the quadriceps for extending the knees, aids in flexing and internally rotating the hips, and helps to align the kneecaps to face forward. You can further refine alignment in this pose by using the adductors longus and brevis and their synergist, the pectineus. Co-activating these muscles and the TFL balances external and internal rotation of the femurs while at the same time synergizing hip flexion. 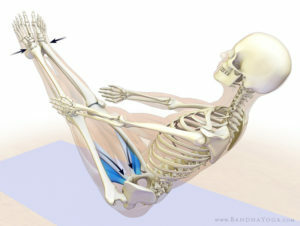 Engaging the adductor group in Utkatasana and Navasana brings awareness and control of these muscles. 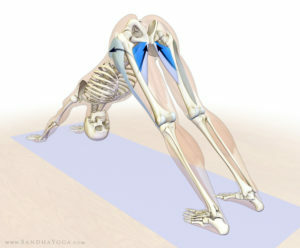 Once you get a feel for this, contract them directly to refine alignment of the leg bones in Downward Facing Dog. You can apply this same principle in Urdhva Hastasana (Tadasana with the arms raised overhead) and other poses. Click here for details. 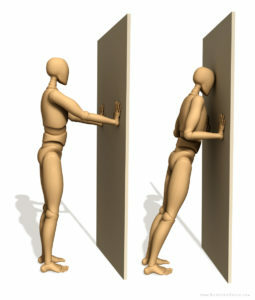 This is an example of the concept of “portability” of the techniques between poses. In yoga classes, you’re probably used to hearing your instructors guiding you to breathe using your diaphragm or what we often call, belly breathing. 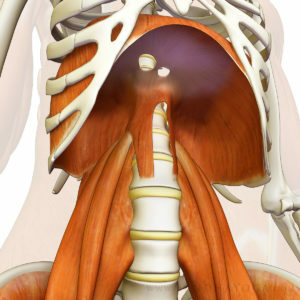 In this blog post, we’re excited to be sharing the knowledge of Dr. Long from Dailybandha.com regarding the diaphragm. In this article, he explains the action of diaphragmatic, or belly breathing, the benefits, various techniques and more. Regular practice of diaphragmatic breathing draws the mental focus into what is known as the “belly brain”. It has a calming effect on the mind while, at the same time, potentially strengthens the diaphragm. I recommend practicing diaphragmatic breathing for 5-10 minutes per day. We have included a video link below to guide your practice and aid you in visualization of the movement of the diaphragm and abdomen. The answer to this question depends on how deep of a breath you take and what part of the diaphragm you are asking about. 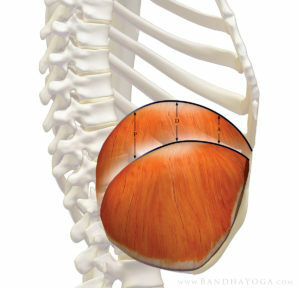 The diaphragm is a sheet like dome-shaped muscle (when it is relaxed). Upon contraction, it flattens out and presses down on the abdomen. The net result is a negative inspiratory pressure, which draws air into the lungs. Tidal, or resting breathing results in smaller movements of the diaphragm, while vital capacity breathing (as in a deep diaphragmatic breath) results in much larger movement. This is where you take a complete full inhalation.